Maybe you have already had fun with a jet ski, a small boat, a kayak, a stand-up paddleboard or even a rowing boat. Anyway, as you are here, there is no doubt you are already passionate about boating! Of course, there is no recreational activity more addicting and refreshing than navigating. The FS 180 was designed for you, who is seeking your first fiberglass boat to carry more people on board, to go farther, and to spend more time on board. Therefore, the FS 180 was designed to attract the most discerning eyes and developed to ride safely and comfortably, all this at an affordable price. 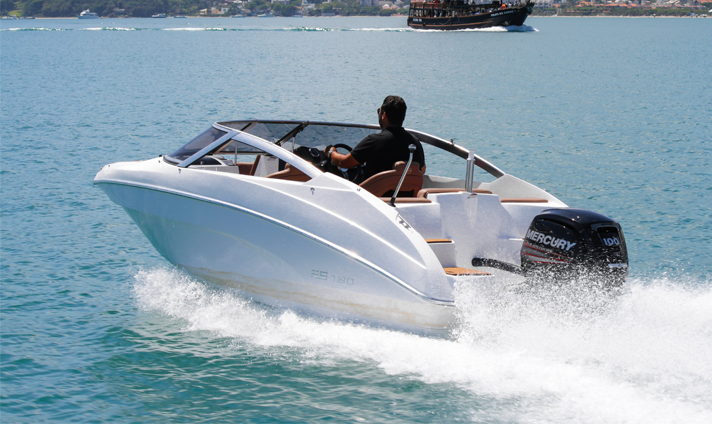 If you are looking for a motorboat that will bring you a lot of pleasure and no annoyance, you have just found it! It is no wonder that the FS 180 features a ski-towing pylon as a standard item; the hydrodynamic design of its hull is suitable for both outings and water sports practice. 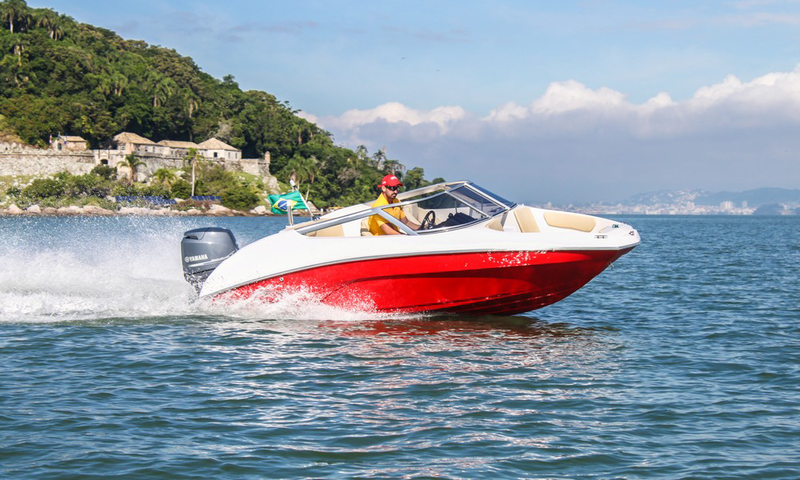 If you plan to take your family to wakeboarding, waterskiing, or even tubing, you can rest assured that you have just chosen the ideal motorboat. There is no age or weight limitation for practicing a water sport; wanting is enough and a lot of fun is guaranteed! Despite being the smallest motorboat of FS Yachts shipyard’s line, as well as being open and having no toilet, the FS 180 received a special treatment in its details, which resemble those of imported models, especially the ones from the US. It also surprised us on account of a pretty stable ride. 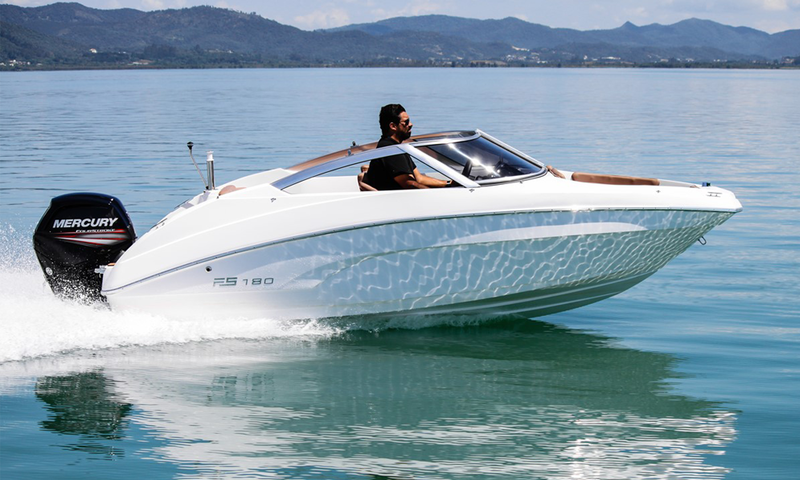 Launched in June 2013, the FS 180 has inherited the outlines, innovations, and good design of their elder sisters, ranging from 20.5 to 21.5 feet, having added a bold style and an exciting navigation, to fight for a place in the competitive segment of motorboats less than 20 feet in length. “It is no secret that FS Yachts shipyard’s motorboats have a young and dashing style, and over 1,700 units sold since its establishment back in 1998 have always held up on their combination of innovative design, reliable navigation, and good second-hand sale.” However, few will remember that the first boat produced by the shipyard was an 18-foot, which later was discontinued, giving place to somewhat larger boats ranging from 21 to 23 feet, besides the shipyard’s top product, the new FS 320 Elite. Thus, the release of the FS 180 is, in a way, a rescue of the way it all began. Therefore, the shipyard has worked carefully to add to it all the good things that its elder, more “experienced” sisters had conquered and produced a respectable youngest. The FS 180 is a really new boat. The strong influence coming from the FS 205 and FS 215 is noticed mainly in its design and hull bottom, which seem to be the same project, under the responsibility of Rinaldi Yacht Design. This is an open-bow boat with no toilet, which can be equipped with an outboard engine ranging from 60 to 115 HP. The unit that we tested was equipped with a 90-HP engine and it performed very well. We believe that it may do even better with an 115-HP engine to give it an extra power just in case of a ride at full capacity (6 passengers + 1 crewman). For the rest, a 90-HP engine perfectly meets the boat’s proposal. It is a simple boat, as an 18-foot should be. However, it has a good beam (2.20 m), which gives it above-the-average stability for its category. It is true that it creates dragging, but it seems that the shipyard has done its homework with care, as the hull bottom has enough merit for ensuring a quick acceleration and a sporty performance; with a 90-HP engine and one person on board, the boat achieved nothing short of 35 knots. Whoever pilots this motorboat will take only a few minutes to enjoy its ride and handling. The position of the steering wheel and throttle lever combined with a bold style and, most important, firmness during sharp turns and quick maneuvers make this motorboat a great 18-foot for those who like to hold the hull under a tight rein. 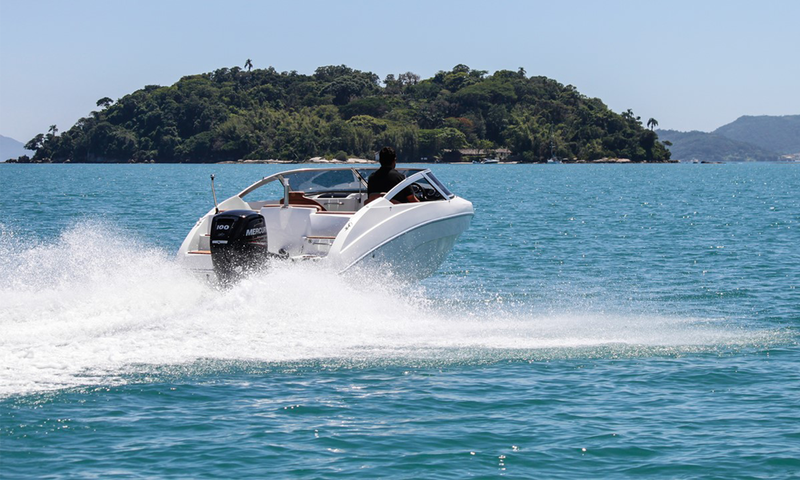 The boat was not equipped with the maximum power of 115 HP, but it still proved to be strong enough to ride well, even at its full capacity, which – according to the shipyard – is six passengers plus the pilot. However, for the sake of comfort and good use in general, it became apparent during our test that it should carry not more than five persons. 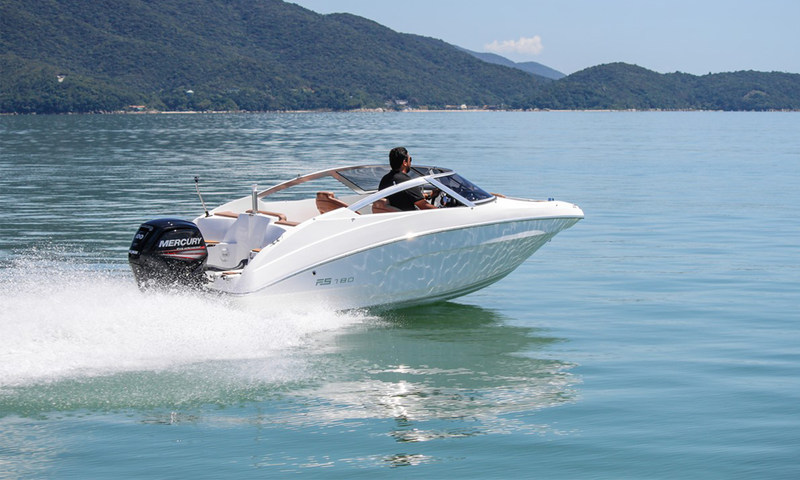 The Yamaha four-stroke, 90-HP, with electronic fuel injection showed a great performance, reaching the marks of 35-knot maximum speed and 28.1-knot cruising speed, both with good ranges, given that the fuel tank capacity is only 80 liters. Under normal conditions, the ride can last up to three hours or 90 nautical miles of uninterrupted navigation, which is a very good result for a boat aimed mainly at lakes, dams, and sheltered bays. For example, it is enough range to allow riding around Santo Amaro Island (Guarujá) twice, with some safety margin. The hull also offered an excellent performance with a surprising stability. 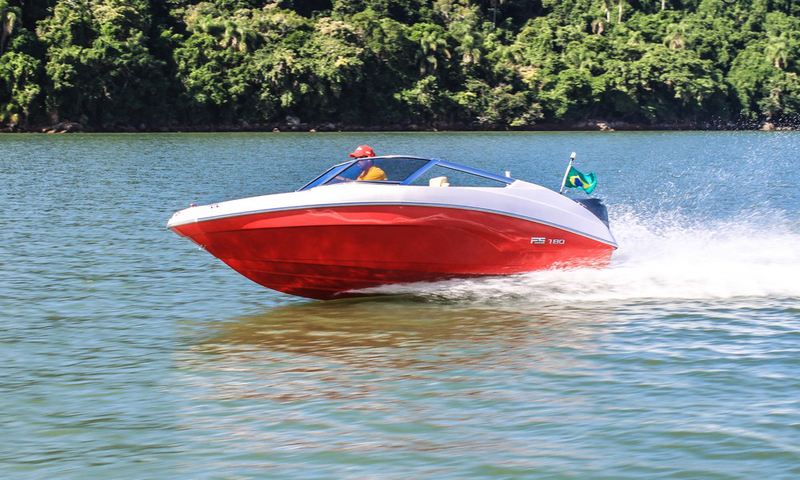 In high-speed, sharp turns or when quickly slaloming from one side to the other, the boat heeled just a little and made the turns with extreme firmness, crossing the wake and wash left by itself without bumping hard. No doubt, it has caused a great impression. The feeling of sportiness was preserved without alarm. Regarding this topic, it is important that the pilot takes into account the number of people on board, as well as the distribution of weight across the boat because, in an 18-foot, any variation makes a difference and all that good performance can be lost if the boat’s gravity center is displaced. Another important point is that the engine power should never be less than 90 HP and it is most probably worth using an 115-HP engine (maximum power) if it is expected to frequently have many people on board. This way, the boat’s strength and performance can be kept at a high level, while the fuel consumption will not necessarily increase too much. The acceleration at around 5.4 seconds proved the nimbleness of the tested configuration, despite the previously mentioned oversized beam. When motorized with medium power (90 HP), it reached its peak speed at 35 knots and held a steady cruise over 28 knots. Therefore, it pleased us a lot. Here are some standards from the US and ABNT (Brazil). The handmade lamination together with the use of materials of good quality and origin give robustness to the hull and protect the fiberglass from the negative effects of osmosis. The finish is simple but nicely made. Since there are no unnecessary items, the boat has been kept light and functional. The panel and windshield contribute to the good piloting feeling. The foredeck’s hexagon-like shape also provides character to the boat. The construction is reliable and the excellent space for stowing the life vests all over the boat under the seats is another point that has really pleased us. The round buoy takes some space up, but it is well located behind the pilot. The windshield is firm and secure, and the hull stability deserves praise. The motorboat is spacious; it has a well-located swim ladder – not too close to the engine – and a shower at the stern for those who are reboarding from a swim. This small motorboat is not only nimble, but it is also appealing due to its sporty finish, its wrap-around windshield and its hexagon-like bow, which conveys style and also enlarges the front deck so that two people can enjoy. It also has several clever solutions such as plenty of stowage with nets under the seats at the stern, the glove box in the dashboard, cup holders all over the deck, and swivel seats for the pilot and companion – for a good interaction between people when the boat is not moving. And yet, for those who like to take care of on-board safety, it allows excellent access for water and fuel tanks for easy inspection. Thus, it has brought about a feeling that it is a well-planned boat, which will most likely satisfy right in the taste of those who appreciate riding inside bays, lakes, and dams. The FS 180 features a good cost-effectiveness, which can prove even better if it follows the same resale strength as its elder sisters – mainly, the FS 230 Scappare. External details such as the stern and hull are very beautiful and capture the beholders’ attention. Its design stands out when compared to the other boats within its marketing segment. 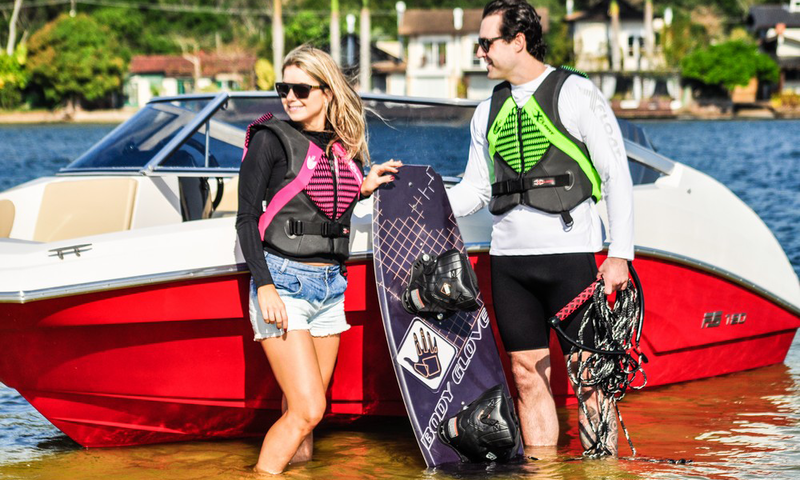 CONCLUSION – Is the FS 180 a motorboat that fits you? Whoever wants outings with up to six people and a good space on board, obtained thanks to the generous 2.22 m beam, will most probably love this 18-foot. One of its main appealing qualities is the bold and modern design, which will keep attractive for some years to come. The creases in the hull, the hexagon-like bow, and the use of straighter lines and remarkable shapes – as in the most modern sports cars – lend this boat an air of sportiness. Its performance was good, with no great peaks, but with a range of about 90 nautical miles, which is good for an 80-liter fuel tank. It is a stable boat, meaning that despite being small it will hardly give passengers a fright during a sharp turn or when cutting – or even jumping – a small wave. Its navigation is extremely firm, with a great lateral stability. Boats of such a size typically have no toilet; if you think having one is indispensable for your family, you would better look for larger models. But it is a great boat for enjoying amazing moments and even for waterskiing! If it follows the reputation for good resale as the larger boats manufactured by FS Yachts shipyard, this aspect may become an important decision-making factor.